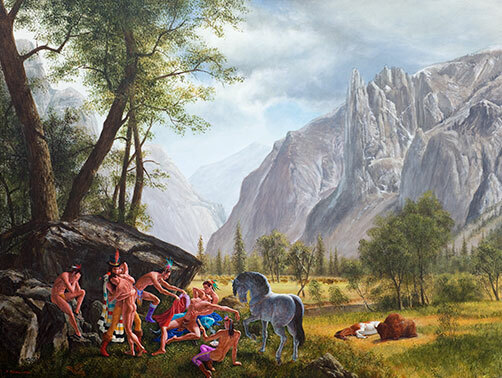 Stunning, vibrant, and sometimes shocking, Monkman’s work is essential to any good history lesson. 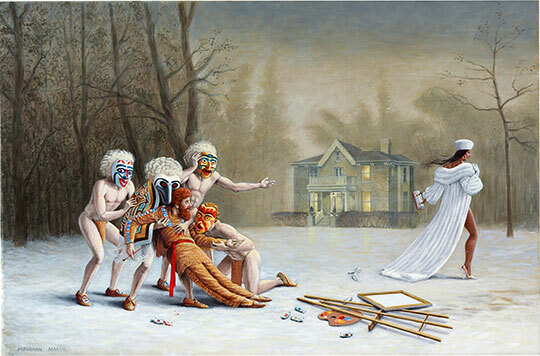 His current exhibit House of Miss Chiefis taking place at Artspace in a small Ontarian city very dear to my heart, Peterborough, who was also lucky enough to host Monkman’s traveling interactive piece Captured: Portraiture and the Permanent Collection, where guests were invited to dress up in cotume and pose for “period” photographs. 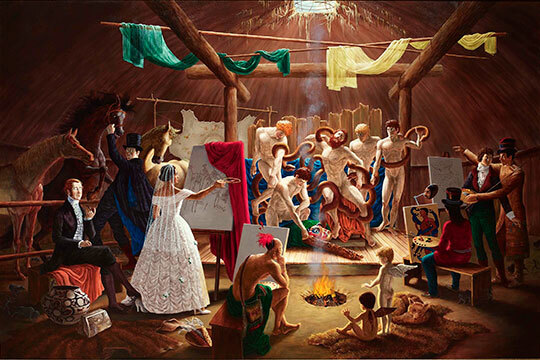 The exhibit challenges and “redefines the roles, assumptions and politics of traditional portraiture by relating them to the narratives of contemporary artists.” (source). 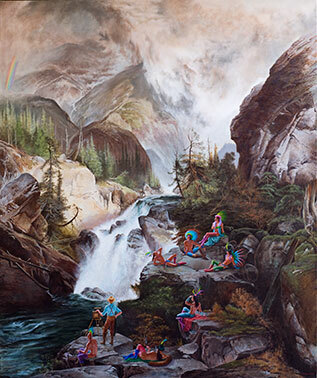 I was lucky enough to attend the event, see some of Monkman’s films, and become an avid fan. 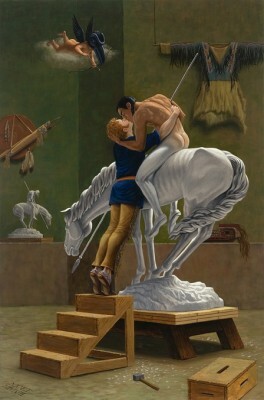 To see more of Kent Monkman’s work, you can visit his website, www.kentmonkman.com, or check out his amazing film project, a collaboration with Gisèle Gordon, at www.urbannation.com. Fine info. Great post, have a good day! Interesting information. I appreciate your effort, very informative and easy to understand. I’m impressed, I must say. Really seldom do I see a blog that is both educative and entertaining, and let me tell you, you have hit the nail on the head. Your post is outstanding; the issue is something that not a lot of people are speaking intelligently about. I am very happy that I stumbled across this in my search for something relating to this. I was extremely tickled to stumble across this site.I needed to thank you for this Interesting weblog!! I really enjoyed every small bit of it and I have you favorited to check out new stories you post. Magic. Seasons Greetings to you. OMG! It’s like you understand my mind! You seem to know so much about this, like you wrote the book in it or something. I think that you can do with some pics to drive the message home a bit, but other than that, this is helpful blog post. A wonderful read. I will definitely revisit again. This won’t allow you stand out from the crowd. I am a Boston Cab pilotand I was doing a research for the keyword Boston Taxi when I found this blog. I must say I revere the thoughts you have outlined here and look forward to coming back and learning more. I just found your fantastic site and I have to say how much I enjoy what you have outlined. 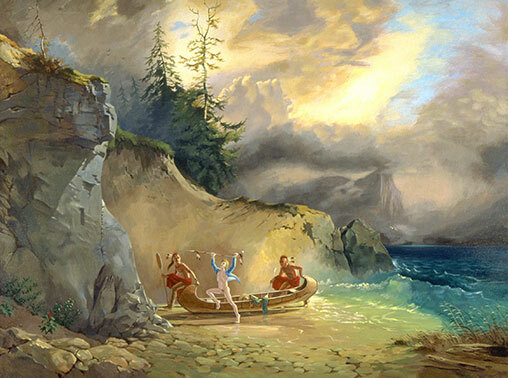 I hope to vistit sometime soonand find something else I enjoy. Please keep up The tremendous effort. Thanks a lot for this! I havent been this excited via a weblog for a long time! Youve acquired it, doesn’t matter what that means in blogging. HaHa. You’re definitely someone that has words to disclose that folks need to hear. Carry on the fantastic work. Keep on inspiring the people! Hey! It’s like you understand my mind! You seem to know a lot about this, just like you wrote the book in it or something. I think that you could do with some pictures to drive the message home a bit, but other than that, this is helpful blog. A outstanding read. I’ll certainly be back. still I puzzle about some parts and I can’t decide what sort of opinion I should express about this.